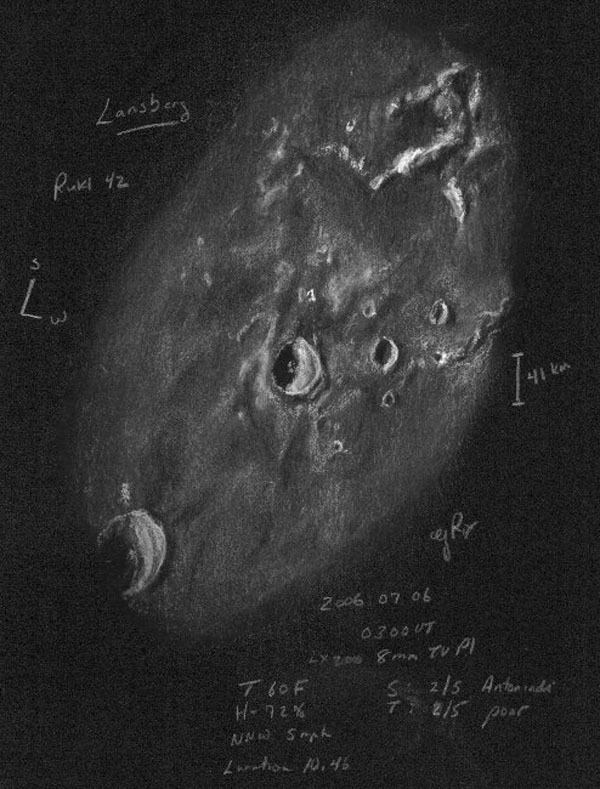 On this rather fine fall night, with the sunrise shadow moving across Sinus Roris, yet not quite reaching crater Harding, I was able to see and sketch the volcanic mound feature known as Mons Rümker, named after German astronomer Karl L. C. Rümker. This hummocky volcanic multi-domed plateau is raised above the basaltic plain of northwestern Oceanus Procellarum just enough to make it stand out in grazing light. In the late 19th and on into the 20th century, this feature was believed to be an old collapsed and battered crater. Today it is known to be the frozen remains of a once active cluster of lunar volcanoes arranged in an incomplete circular arching mound. 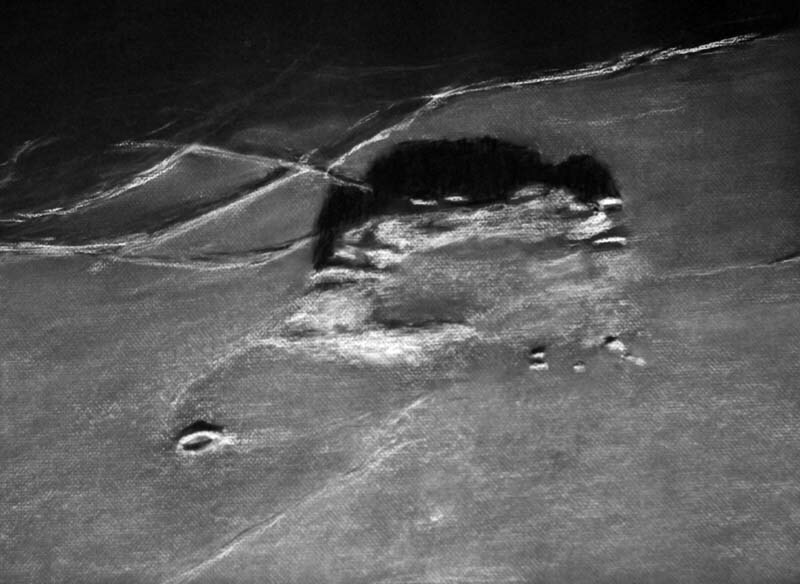 This entire mound measures 70 kilometers across and was observed and sketched while the lighting was good enough to see nice relief from the flat surroundings. 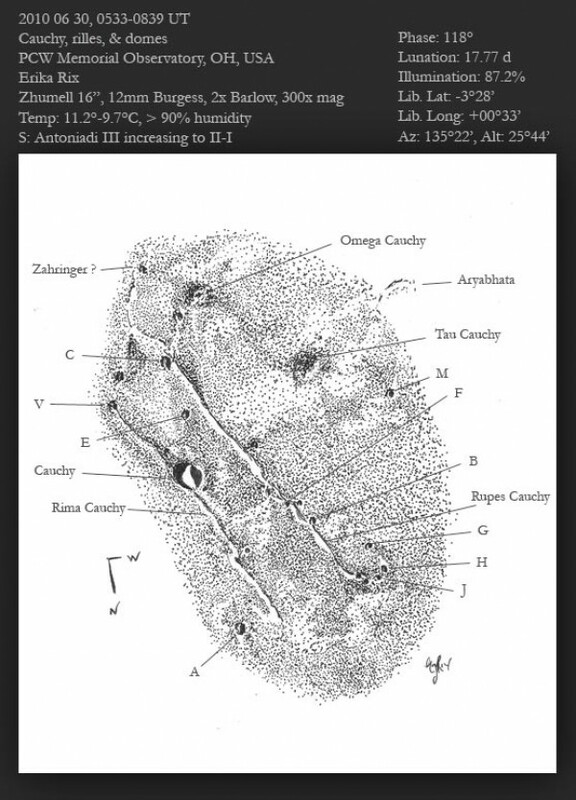 legend, which is one reason my sketches are completed at the telescope. actually see during my session. neither rhyme nor reason of the sketch itself. 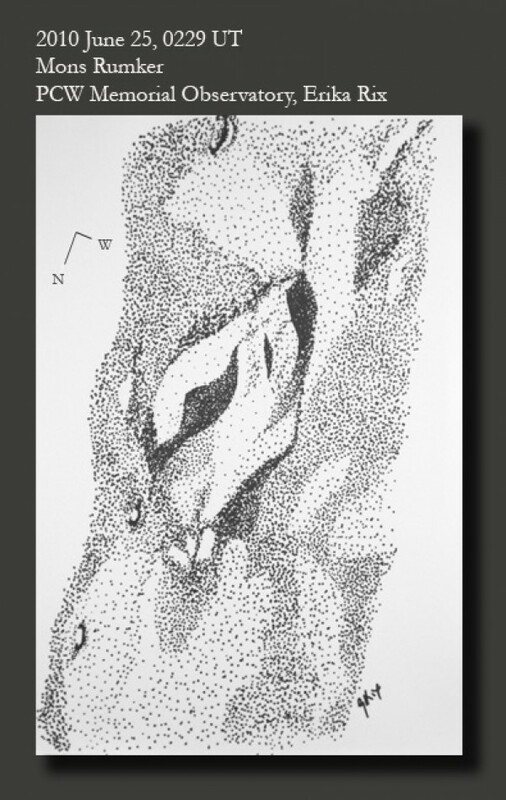 stippling? Plus, I accidentally inverted my craterlets in the re-sketch. moment, he asked me what it was. pencils for the Cauchy sketch. first step is actually do it. The second is doing it again and again. sketches are bound to show a result of my efforts. 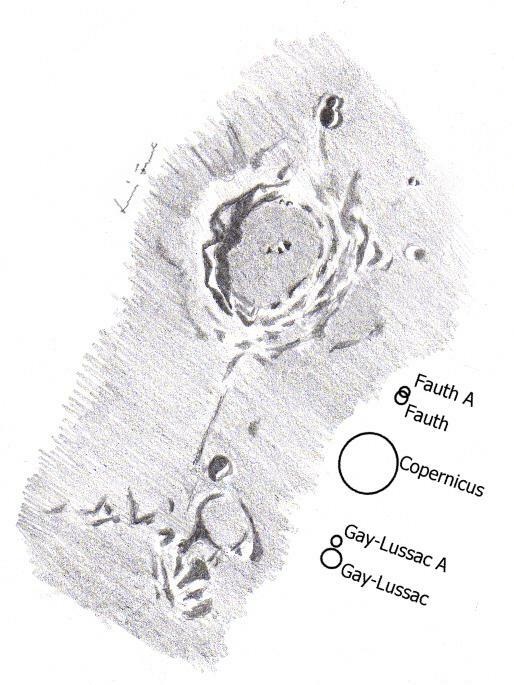 This is my first ever Moon-sketch, displaying craters Copernicus, Fauth and Gay-Lussac with some other sub-craters and domes not noted on the sketch. This is my actual sketch done at the eyepiece, no alterations were made after manually or digitally, other than resizing. It took about 45 minutes to finish, and I’m quite satisfied with it, although I’ve found that sketching the Moon is indeed very hard and very different from sketching deep space objects. Perhaps I should not finish Lunar sketches at the eyepiece but create only drafts with different markings for different shades and create the actual sketch in the warmth of the room. As an additional difficulty, the sky was 100% covered with a thin layer of cloud which kept the image in constant change, only 1 or 2 stars were visible here and there. Moon phase was about 69%. Hello sketcher,all o.k. 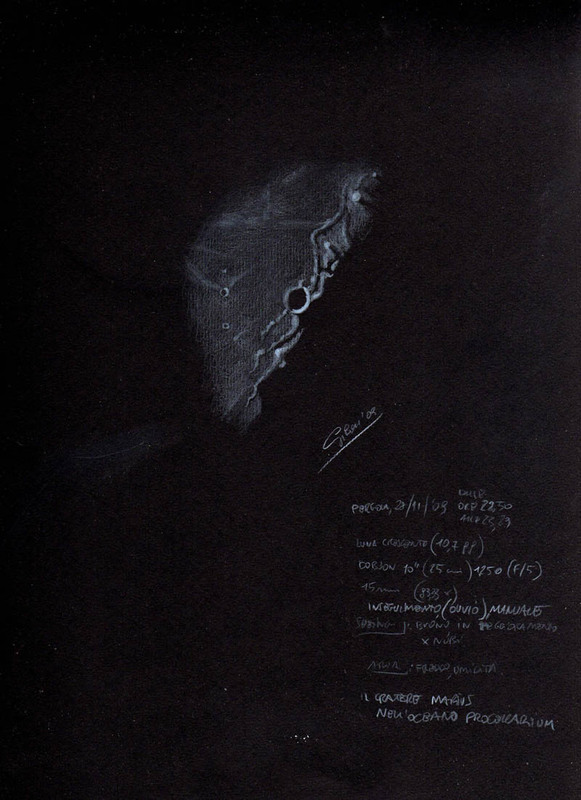 ?This night,the sky was cover by fog and clouds but ,at 10p.m.,the fog go out and the Moon was very hig over my head.I decide for the first time, to take my Dobson 10″ for the Moon and made my sketch with white pencill on black paper. I see the Crater Marius go out from shadow and i decide to made that sketch.I used my 15mm eyepiece (83x).I stopped my sketch because the clouds coming quickly. That sketch is dedicated at Frank McCabe and other sketchers who used this technics. 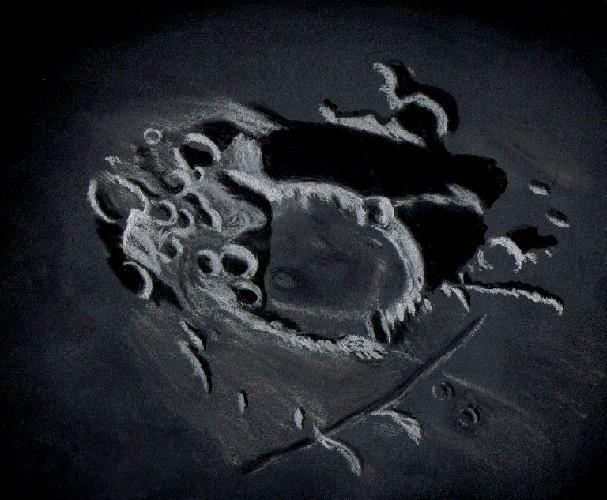 Technics:White pastel on black paper Fabriano3. This sketch is one of my oldest, I made it one year ago. The crater and the domes were very easy to find and observe, this triangle is my favourite Lunar area. ‘É’ means north, ‘Ny’ means west on the sketch. 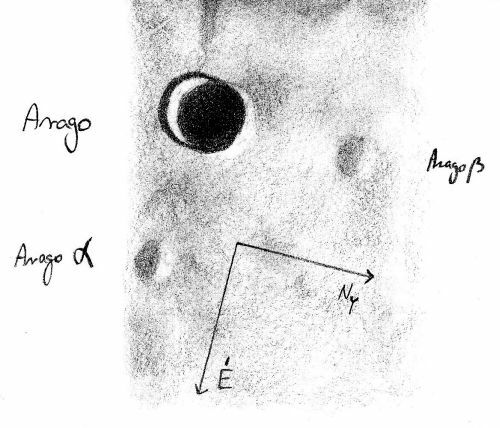 This drawing I made with my Tak FS-102 refractor, magnification was 205x. Transparency was very good, seeing 5-6/10 (Pickering scale). I used white printer paper, HB and 2B pencils. 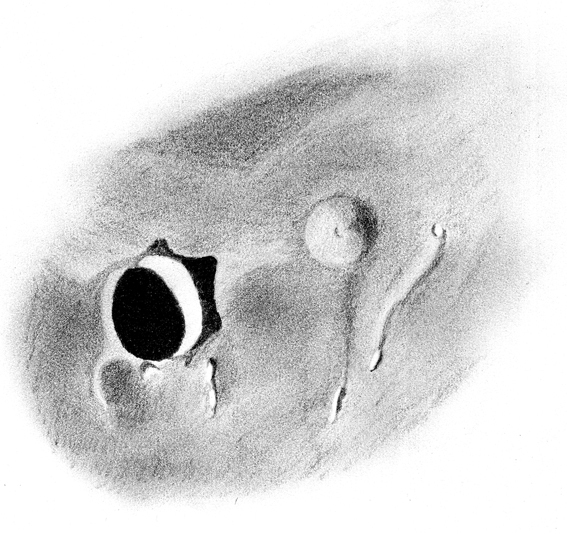 this is one of my first sketches from a Lunar object. I liked to observe the domes of the Moon and I decided to make sketches. The Dome Kies Pi was hard to observ, seeing was not very good (s=5). I made the sketch with graphite pencil. It was very exciting to make this sketch, I hope, my technique will grow up in time. Mons Rumker sits in isolation on the dark basalts of northwest Oceanus Procellarum like a lonely sentinel on the edge of some vast undiscovered wilderness. 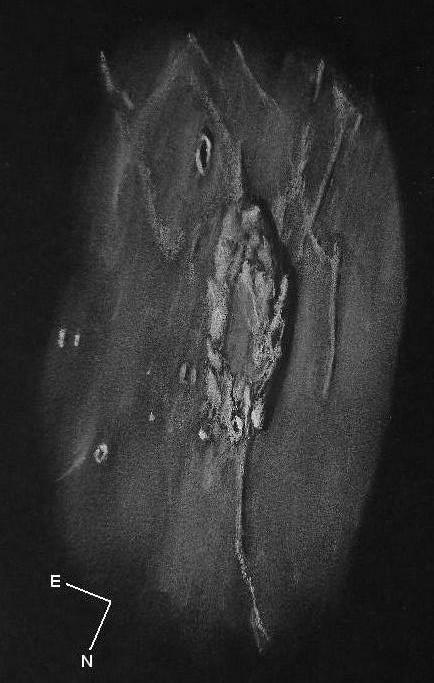 The Rumker Hills dome complex, situated on the western flank of the Aristarchus Plateau, lies on the top of a local swelling that is about 140 km in diameter. It is composed of a remarkable set of about a dozen volcanic domes and low mounds, which are scattered in a rough semi-circular plateau approximately 70 km in diameter. The surficial domes apparently overlay preexisting low domes so that the elevated northwest sections have a pancake like appearance. Despite the long shadows when viewed close to the terminator, nowhere do these domes rise much above 500 meters in elevation from the mean surface of the mare. A central depression to the southeast of the domed crescent displays a strange dichotomy between its darker and lighter floor that is very reminiscent of areas on the Moon that have pyroclastic deposits. The mysteries of Rumker are manifold: why is this the only such layered dome field on the surface of the Moon? Why is located here? Does it predate the mare lavas or is it the representative of the last vestiges of differentiated magmas that ended the mare sequences in this area? Is the central depression part of a preexisting separate domain or were both aspects, both domes and depression deposits, created over the same period of time? At my geographic location during the fall, it is not uncommon to have a sequence of days with fog and mist under heavy cloud cover. At sunset the fog lifted and the sky cleared. It was time to take advantage of this break to observe and sketch. 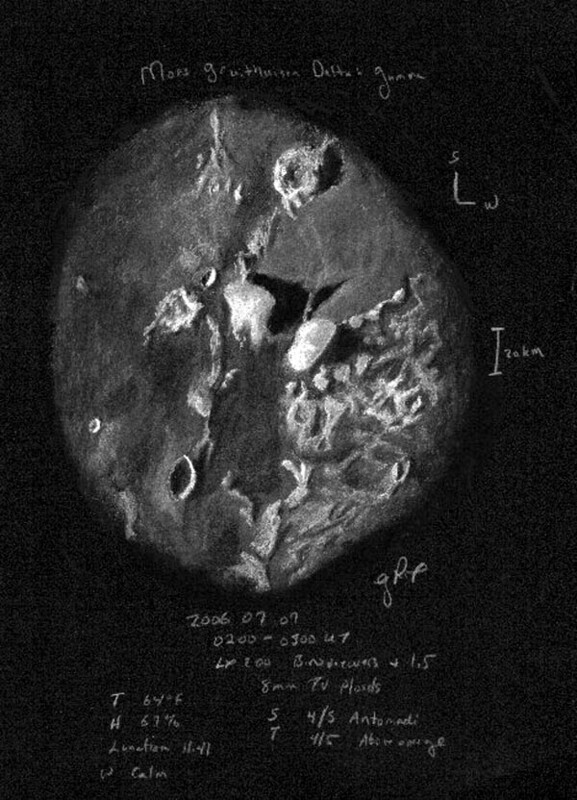 The sketching target I chose near the terminator is Pre-Imbrian era crater Capuanus. This ancient crater rests on the shore of Palus Epidemiarum. At 58 kilometers in diameter, this is a large crater with extensive rim damage from multiple crater impacts. A narrow gap in the low north wall nearly connects the crater floor to the marsh. Brightly illuminated in the rising sun is the high western wall which towers at 2.5 kilometers above the crater floor. The basaltic lava on the floor of the crater appeared mostly dark. Two of the domes or dome-like rises could be detected on the southern crater floor. These volcanoes were active during the age of prokaryotic life here on earth 3.5 billion years ago. Ridges extending from the west of the crater, line up nicely with the margins of both mare Nubium and mare Humorum. Perhaps these are remains of a basin rim which was part of one of these seas.Across the floor of Palus Epidemiarum a wide segment of western Rima Hesiodus could be seen approaching the northern most of these ridge reminants. Two hours after I began sketching clouds moved in and closed my window on the moon. For this sketch I used: black Strathmore 400 Artagain paper, 9”x12”, white and black Conte’pastel pencils and a blending stump. Brightness was slightly decreased after scanning. way to enjoy this hobby to the fullest! if you’re reading this, I absolutely LOVE them! Wow! Thank you both so much!!! beauty, my sketch was cut short and it was never completed). to the rest of the scene in that area. and Gamma were flagging me down and I just could not resist.